I recently had the pleasure of participating in a Delicious Dish cooking class with occupational-therapist-turned-self-taught-chef Carolyn Cohen. I’d heard about her classes for years. The menus were hoarded secrets. Sharing recipes was considered to be horribly bad form. Verboten? Forbidden fruit? I wanted in! After managing to coax a few tidbits from some willing rule-benders, I tried a couple of recipes. They were, indeed, delicious dishes. It wasn’t long before I was on Carolyn’s email list. Schedules were listed, but menus were not. And while I debated whether to sign up, the classes would fill up and sell out within hours of being posted. Who was this Carolyn Cohen? And, more importantly, what was she dishing out? Finally, a friend asked if I wanted to join a private group she was organizing and I jumped at the chance. The class was designed to be healthy, family friendly, good for entertaining and “gluten-free optional”—meaning, the recipes could be made either with or without gluten. I am not so healthy, though I try to start off the week that way. My family rarely eats the masterpieces I cook. And I am nothing if not a glutton for gluten. I was in. A week before the event, the original organizer had to drop out, along with half of the class. After a mad scramble to collect a minimum of 10 bodies—10 $95 pre-paid bodies—we ended up with 13 rarin’ to go. Carolyn called me to plan the menu. At her suggestion, we swapped some of the original planned mains and agreed to go completely gluten free because we had a celiac among us, as well as the founder of the Gluten Free Garage. Carolyn was used to all kinds of special dietary requests, so going GF didn’t faze her in the slightest. The night of our class, we descended upon Carolyn’s kitchen, where she commandeered 13 of the chattiest ladies in town. Pouring glasses of red, to go with the Quinoa Pizza Bites she provided as a starter, Carolyn got right down to business. She was a mountain of information both healthy and practical. Onion goggles to stop the waterworks. Kevlar gloves to prevent slicing off fingers. A list of suppliers and shops—and salts. Kitchen scales. Dough scoopers. Slicers. Pine nuts. Olive oil. She had it all covered, right down to the gluten-free breadcrumbs! We all laughed, learned and ate. A lot. 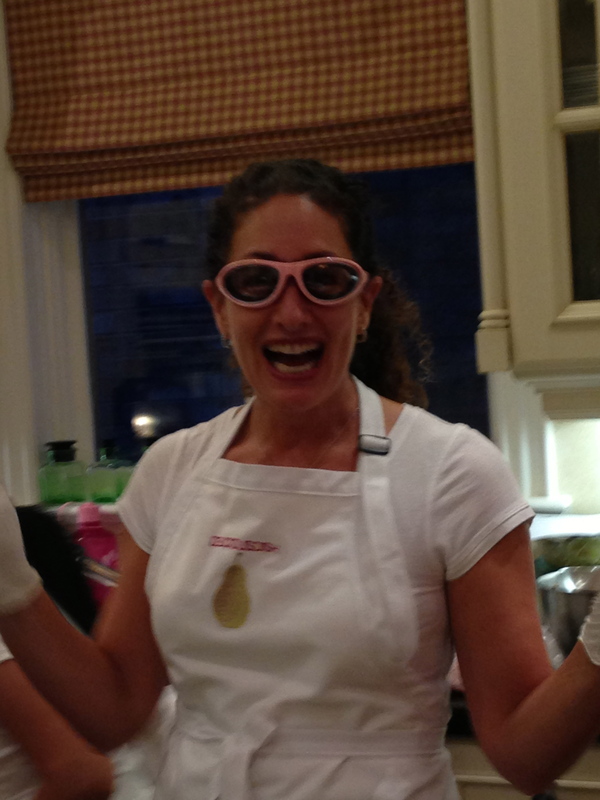 No more tears: Delicious Dish’s Carolyn Cohen dons her onion goggles. 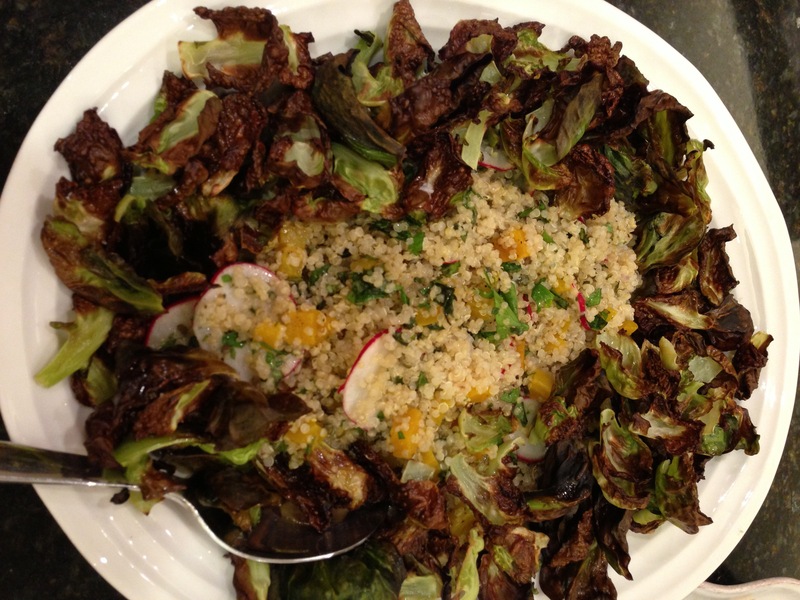 First up was an Herbed Quinoa Salad (or side) with beets, radish and…wait for it….crispy Brussels sprouts. Anything with crispy Brussels sprouts and I’m in. But look how gorgeous this golden quinoa is with its beautiful Brussels sprout collar. Divine. Chipotle Chicken Burgers with Guacamame. These sliders were smoky goodness. Spicy and beyond tasty and—get this—cooked under the broiler! Who knew? And that stunning bright green topper? It’s a dip! It’s a sauce! It’s not guacamole, but guacaMAME. Avocado + Edamame = one tasty topping. On anything. Or nothing! 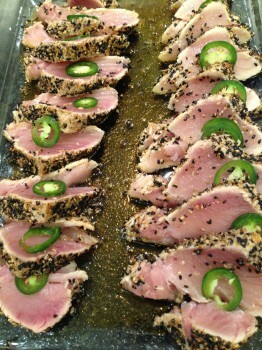 My fave of the night was the Seared Tuna with Smoked Sea Salt, Sesame and Pepper Crust on a soy-maple glaze. This ain’t your gourmando’s ahi. It’s albacore! And it’s better, believe it or not. None of the gristle, all of the taste. And the glaze? Sublime! 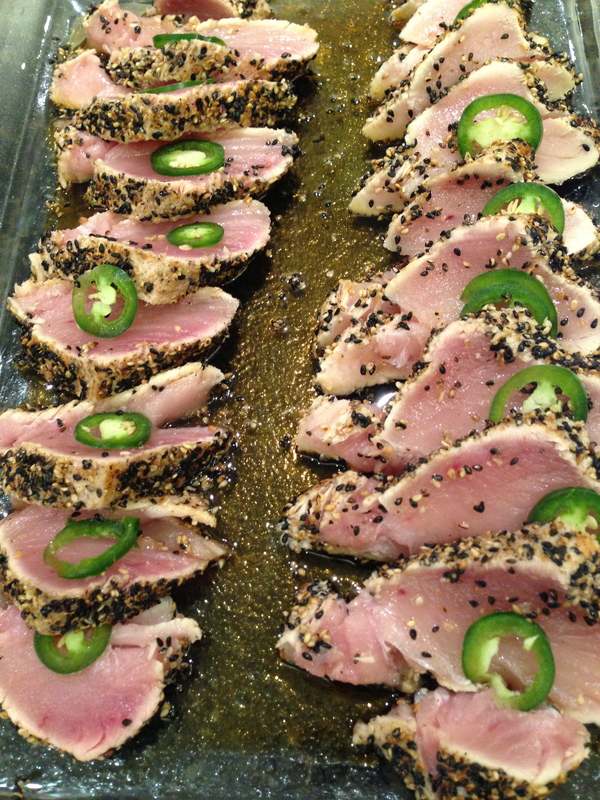 Instead of finishing it off on top, the seared tuna is sliced and sandwiched with a sliver of jalapeno before resting on a bed of glaze. Brilliant! 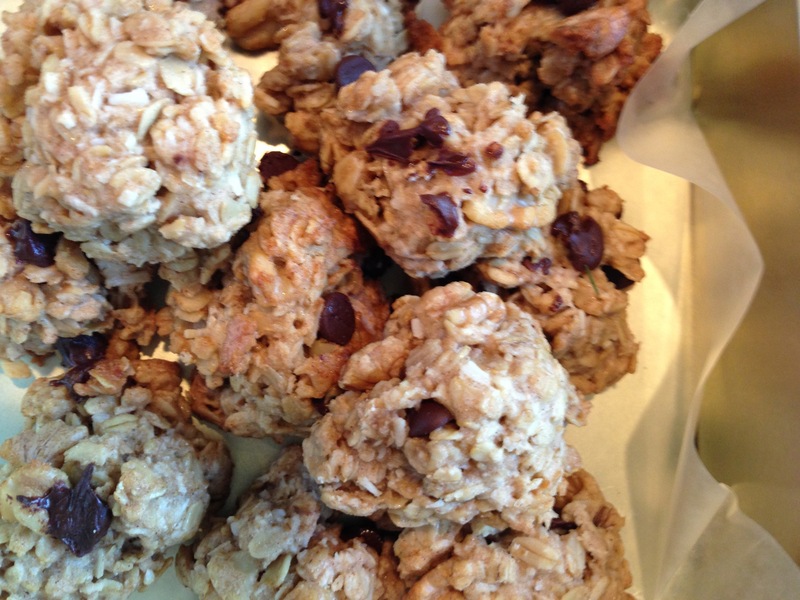 And then there were the cookies: Granola Cookies. Family friendly, no doubt—if there are any left. Our crowd inhaled them, some of us even sneaking in extras. And by extras I mean thirds. OK, fourths. Though made with gluten-free oats, they taste neither gluten-free nor healthy, in the best possible way. 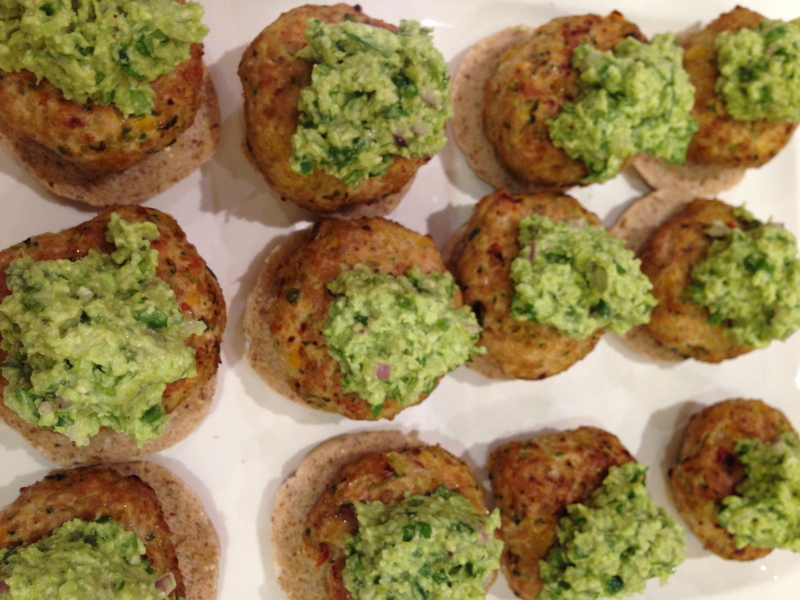 Carolyn has generously allowed me to break with protocol and publish a recipe! Allow me to present The Granola Cookie. Resistance is futile. 2. In a large bowl, combine oats, flour, coconut, cinnamon and salt. 3. In a smaller bowl or measuring cup, stir together maple syrup, oil and vanilla. 5. Fold in walnuts, raisins and/or chocolate chips. 6. Using a soup spoon, scoop batter into mounds onto the prepared cookie sheet. You may need to form them into mounds with your fingers. They may appear as if they are not coming together, but they bake up great! Don’t worry about crowding the pan a little, they do not spread. 7. Bake for 15 minutes, or until lightly browned. Copyright 2013. 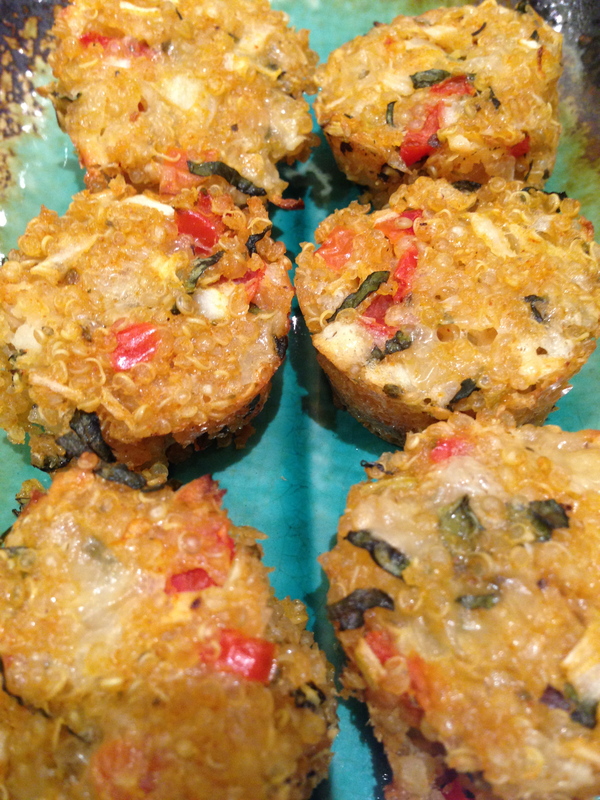 May not be reproduced or used for commercial purposes without permission of Delicious Dish/Carolyn Cohen. Carolyn Cohen offers her Delicious Dish classes all year round. Day or evening. Private or GenPop. Your kitchen or hers. Be warned: If you head to her place I might be the one loitering outside, looking for scraps. 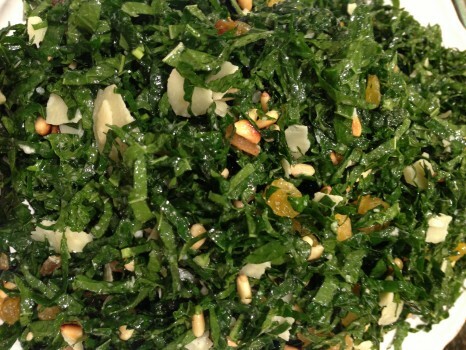 For more info, contact Carolyn at deliciousdish@rogers.com. Carolyn Drebin is a screenwriter by profession who currently works for her three young sons. A pop-culture obsessive and big-time foodie, she is a contributor to numerous websites and publications, including KingWest, Mrs. Robinson, Rotman School of Management magazine and more. She can be found ranting and raving at Mother of All Mavens. Posted in Guest blog, Recipes we ❤, Tummy love.